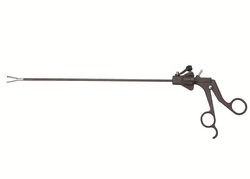 Spectrum Surgical is pleased to announce the expansion of its product line, Spectra-Scopic™ Laparoscopic Instruments. Spectrum Surgical Instruments Corp. is pleased to introduce their surgical instrument line of Spectra-Scopic™ Laparoscopic Instruments. With over 30 jaw patterns to choose from, Spectrum’s Spectra-Scopic™ lap instruments are lightweight, ergonomically designed, and well-balanced. All patterns are fully autoclavable and available with non-conductive, ratcheted or non-ratcheted handles. In addition, Spectrum’s Spectra-Scopic™ lap instruments are easy to assemble, are rotatable, and include a flush port. For more information, please contact Derek Lashua, Marketing Director, at 800-444-5644. Spectrum Surgical Instruments has been providing a full line of surgical instruments for Human and Animal health since 1982. Spectrum is a leading provider of surgical instrument repair, sharpening and restoration. Spectrum Surgical provides surgical equipment to surgery centers and veterinary centers across the United States.